Oil on canvas mounted on panel, 39 x 29 cm. In the doorway to a washhouse, a washing girl stoops over the tub in front of her. With a look of deep concentration, she washes a white garment while the other pieces of the outfit hang on the chair in the foreground. The chair is placed in the adjoining courtyard, and a dog is resting upon it. Pieter de Hooch’s depiction of a tranquil and mundane scene with a hard-working girl as the main subject emphasises an ideal of domestic virtues that prevailed in contemporary Dutch households. With his highly popular emblem books, the poet Jacob Cats promoted his view of the virtuous woman as one who was abstinent and industrious. 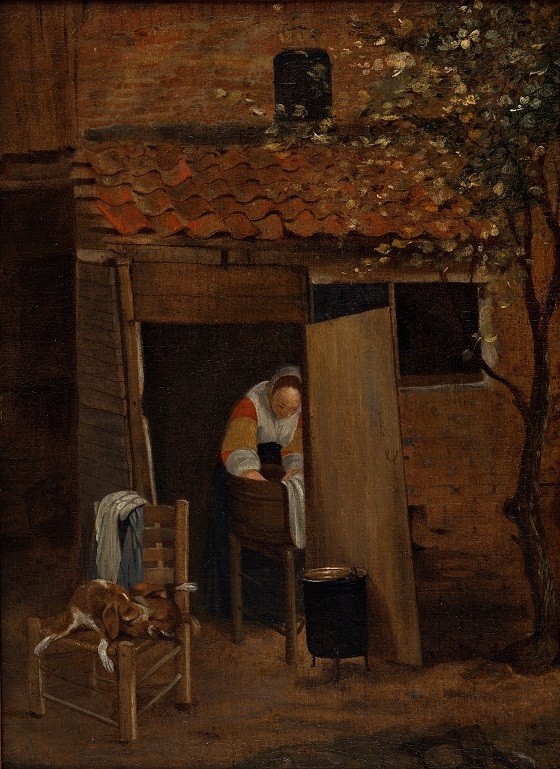 These virtues are also what characterise Pieter de Hooch’s laundry maid.